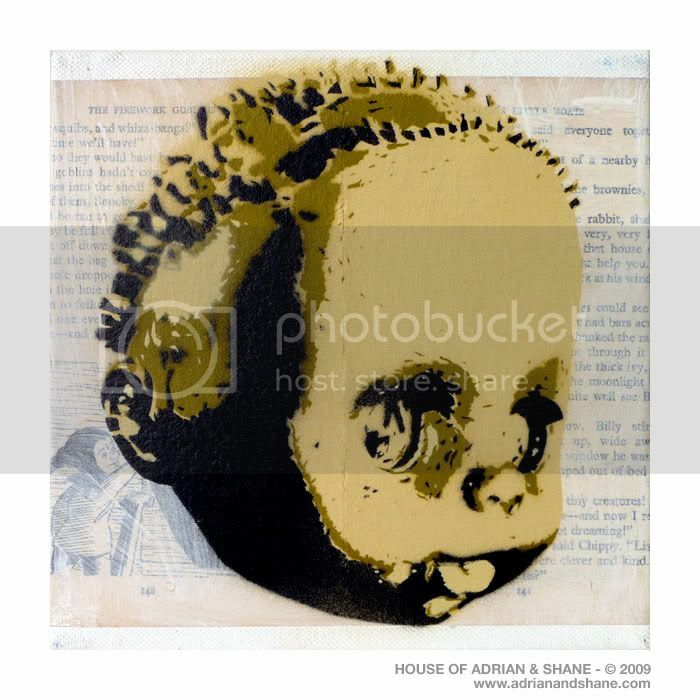 Added on May 19, 2011 by Adrian+Shane. 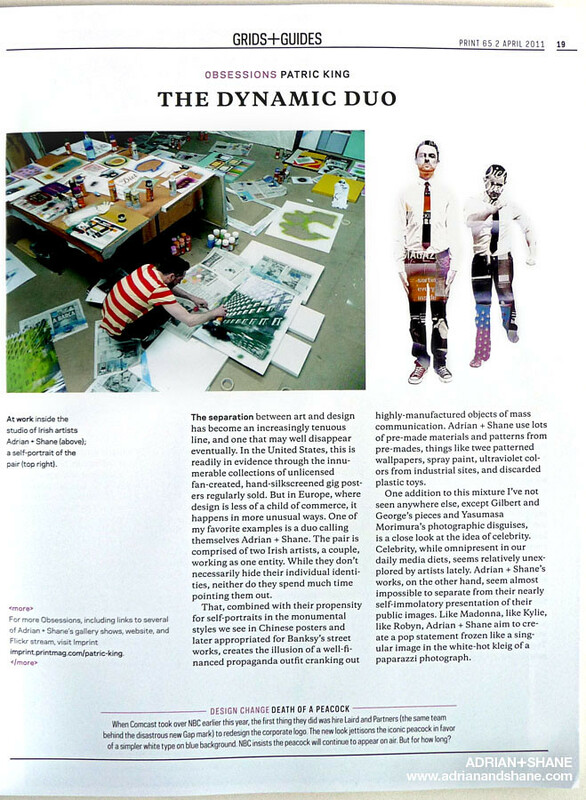 We just got our hands on the April issue of US art and design magazine Print. 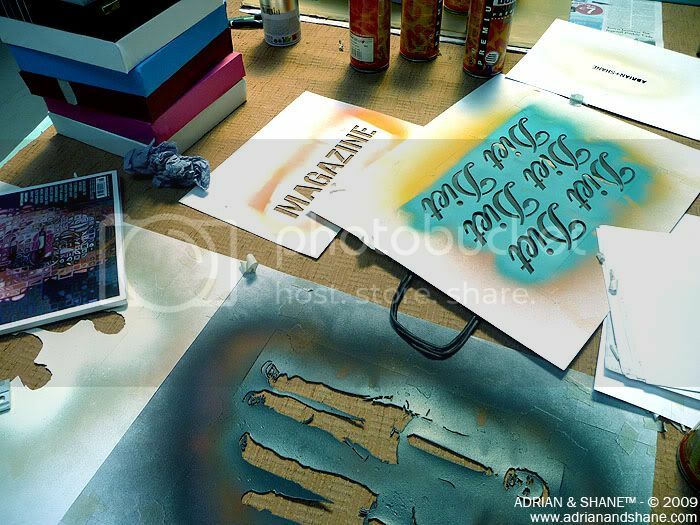 It's "The Future Issue", and it features a full page Adrian+Shane article. 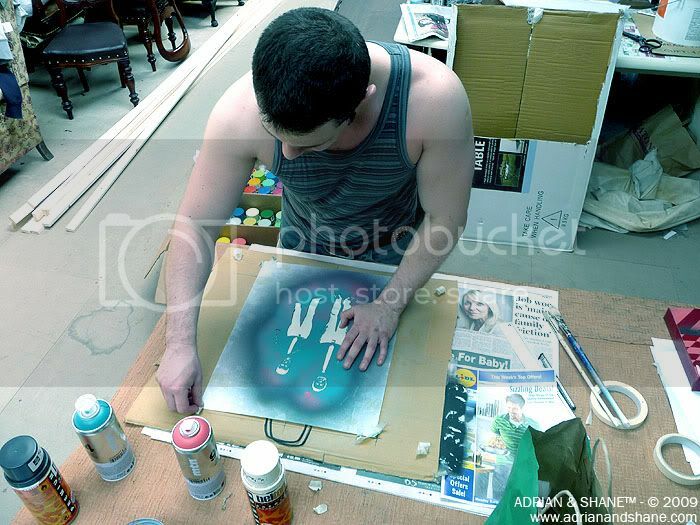 Click image below to view larger version. 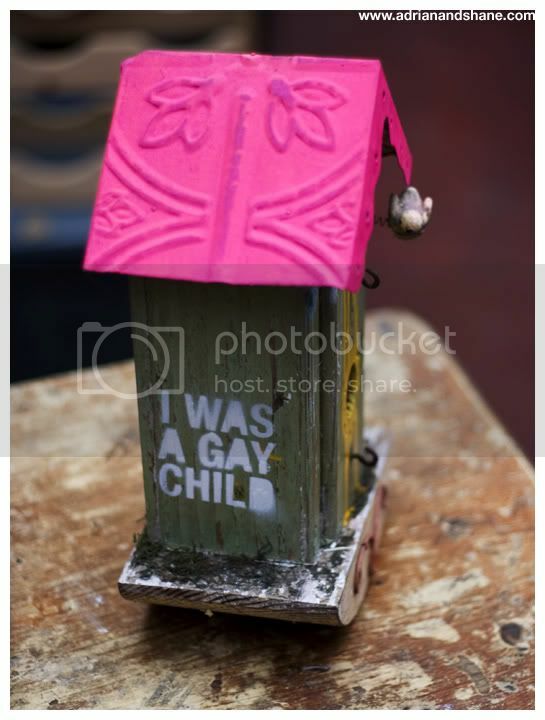 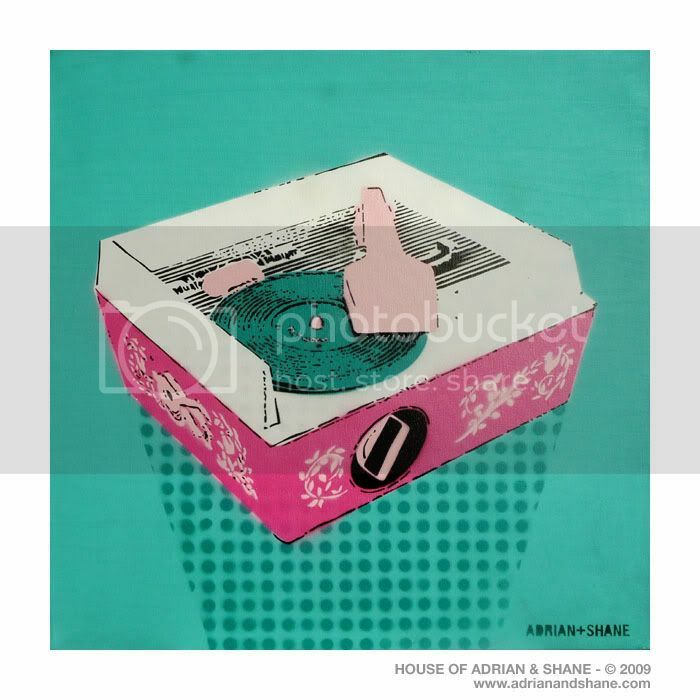 In "adrian + shane", "adrian and shane", "adrian", "art", "article", "artist", "design", "future", "gay", "issue", "magazine", "patric king", "print", "shane"
Added on February 8, 2011 by Adrian+Shane. 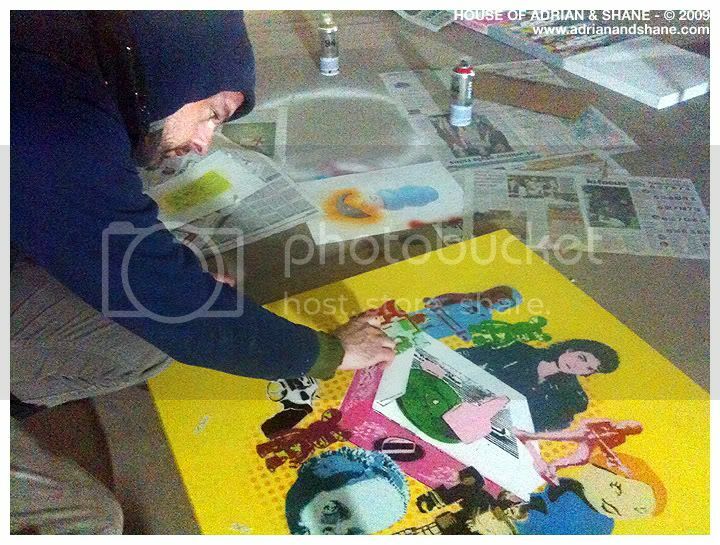 Adrian+Shane were invited to make two large paintings for the 'Graffiti/Street Art Exhibition' which opened at the EU Commission offices in Dublin on September 28th 2010. 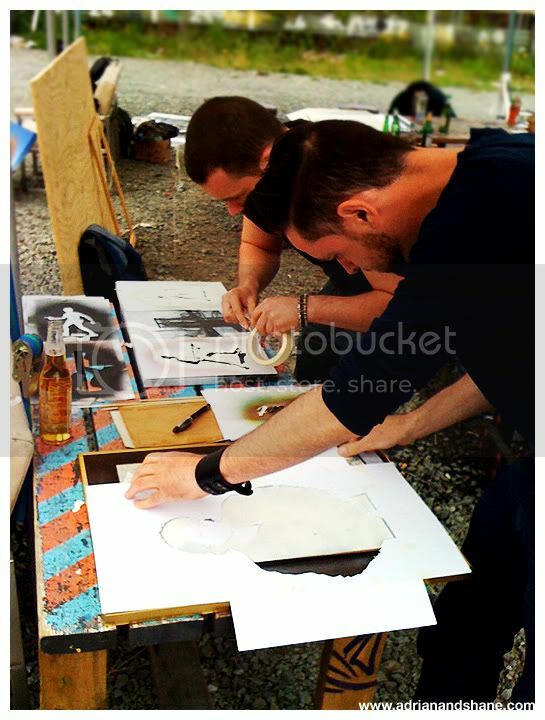 This is the time lapse video of them making the paintings on a very cold Saturday in mid September. 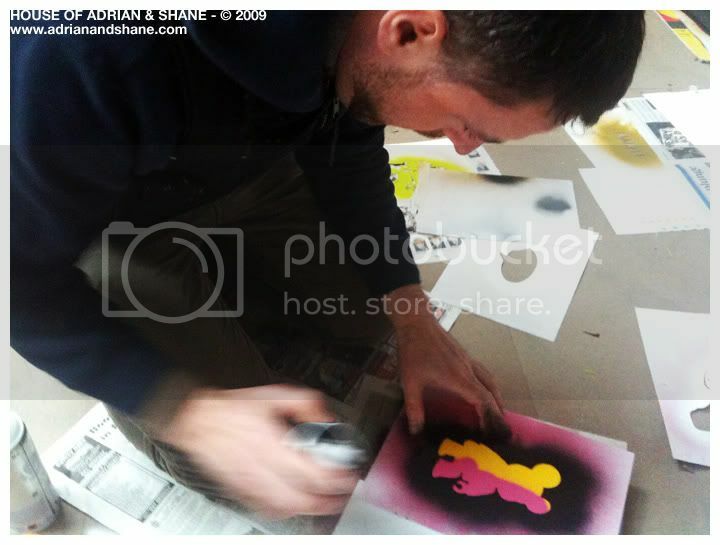 In "EU Commission office", "adrian", "art", "artists", "dublin", "exhibition", "gay", "graffiti", "painting", "shane", "stencil", "stenciling", "street art", "street", "studio", "time lapse", "video", "youtube"
Added on August 9, 2010 by Adrian+Shane. 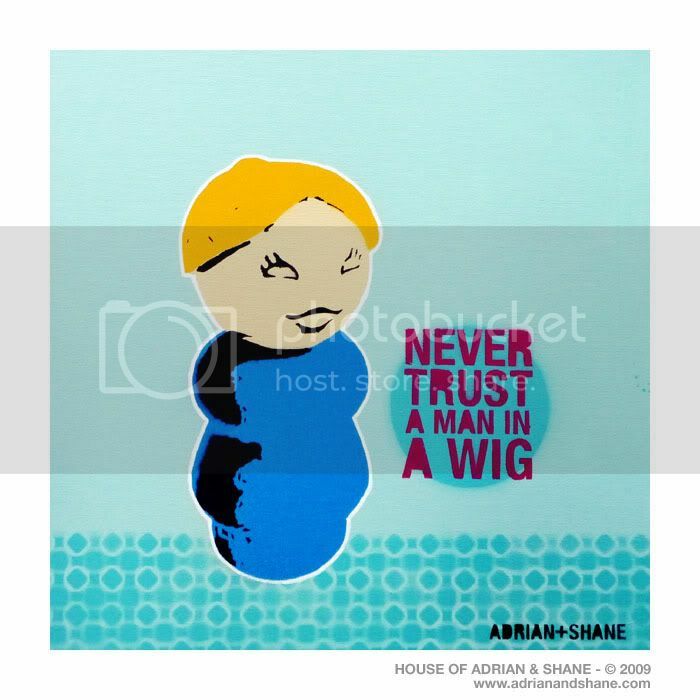 Scott De Buitléir interviews Adrian + Shane in the latest Polari Magazine. 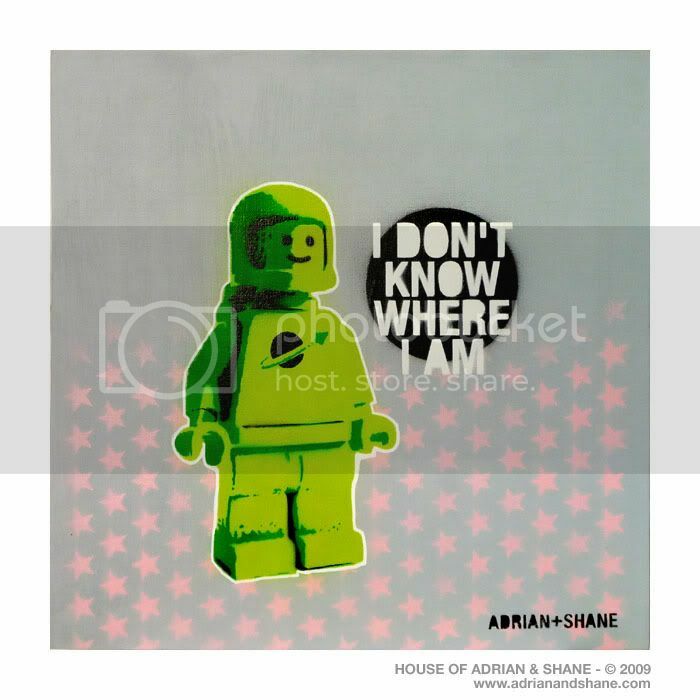 In "adrian + shane", "adrian", "art", "artist", "duo", "gay", "interview", "magazine", "modern", "online magazine", "polari magazine", "polari", "shane", "stencil art", "stencil", "streetart", "www.adrianandshane.com"
Added on August 3, 2010 by Adrian+Shane. 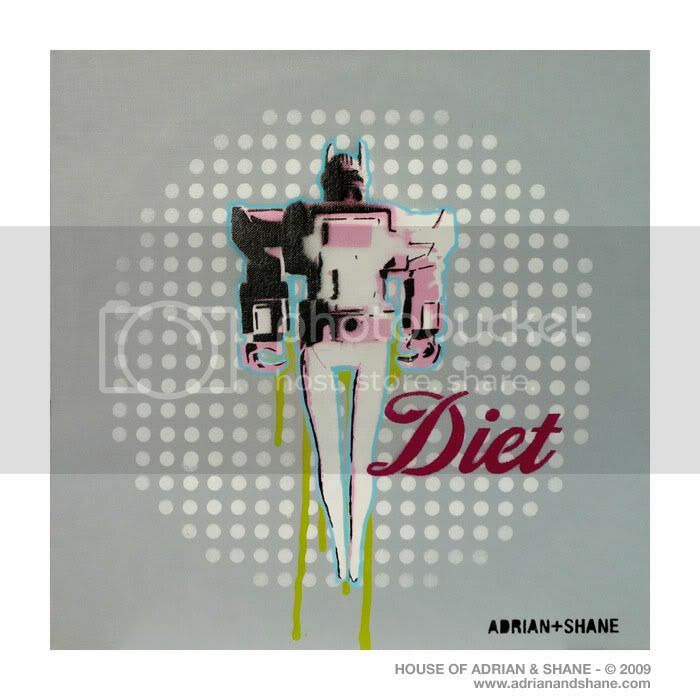 In "Hipstamatic", "Portrait", "Self Portrait", "Selfportrait", "adrian + shane", "adrian", "art", "artist", "close-up", "digital", "fag", "gay", "irish", "photograph", "photography", "polaroid", "queer"
Added on April 7, 2010 by Adrian+Shane. 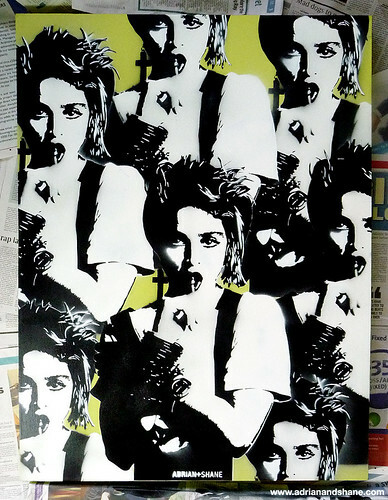 Medium: Acrylic and spray paint (stencil) on canvas. 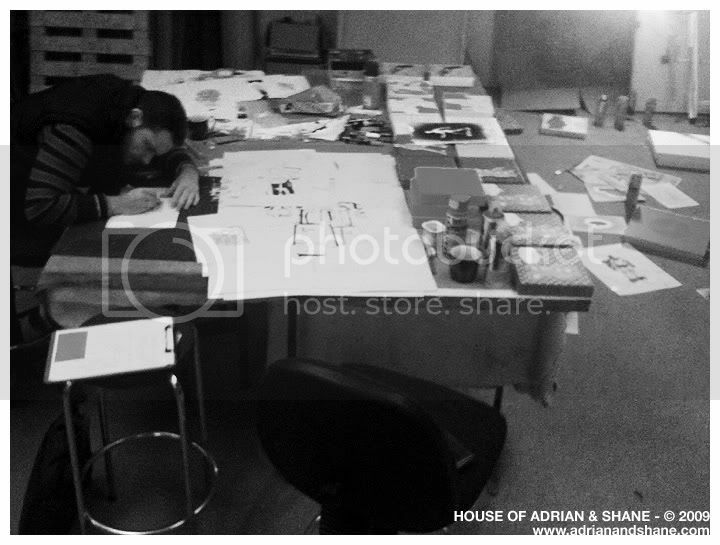 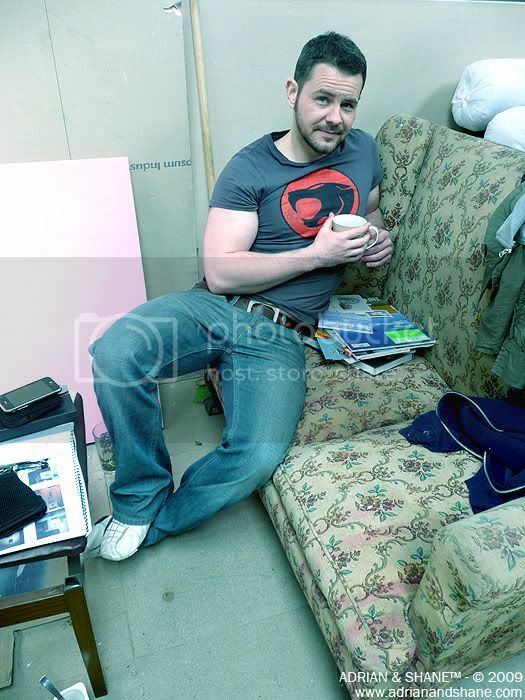 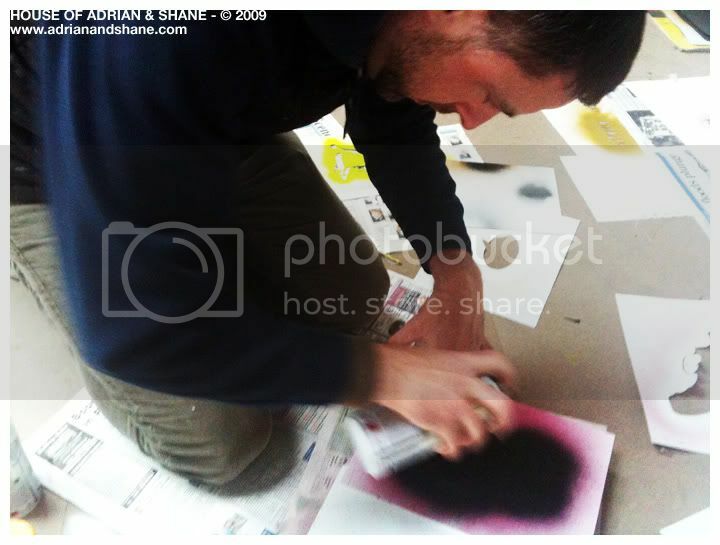 In "adrian + shane", "adrian", "art", "artist", "artwork", "drogheda", "dublin", "shane", "short film", "stencil", "stenciling", "studio"
Added on March 4, 2010 by Adrian+Shane. 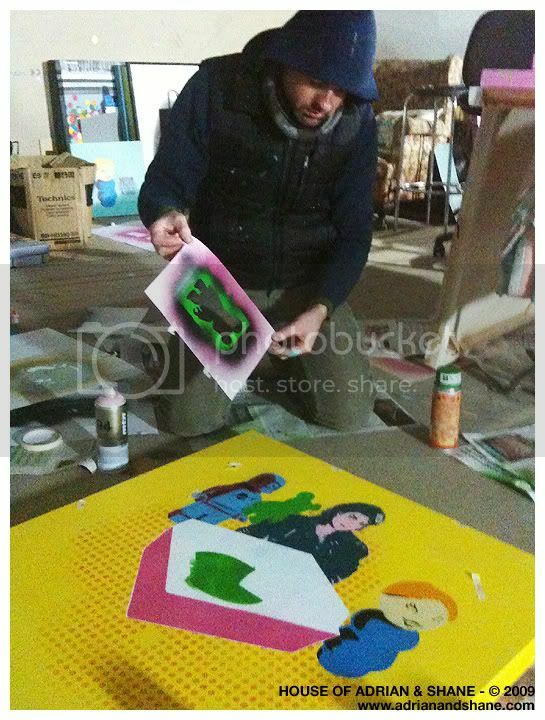 Our finished piece for the 'Under The Influence' exhibition which opens tomorrow night (March 5th 2010) at the Front Lounge, Dublin. 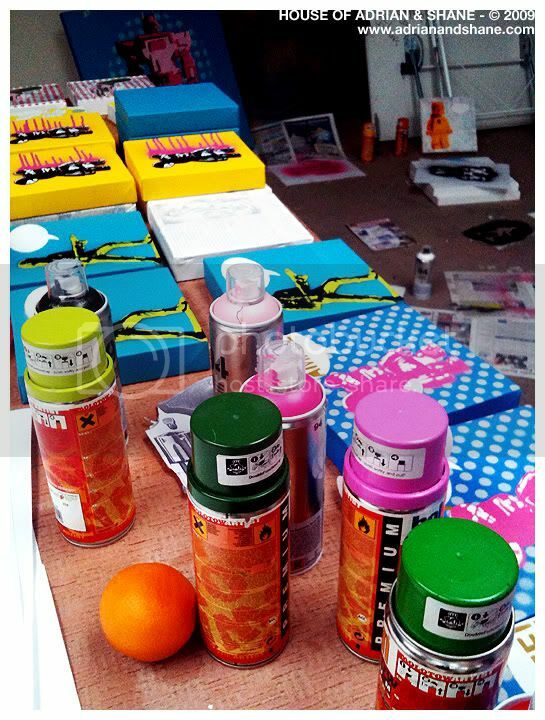 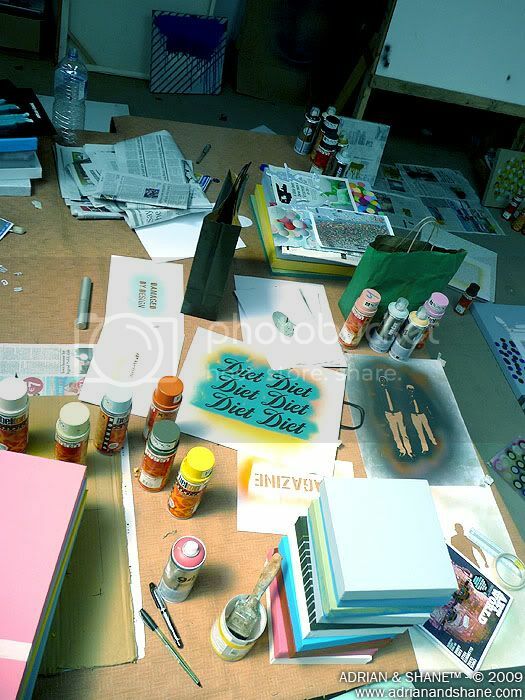 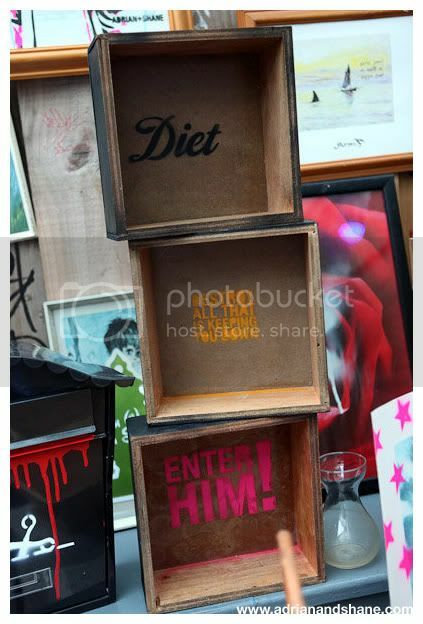 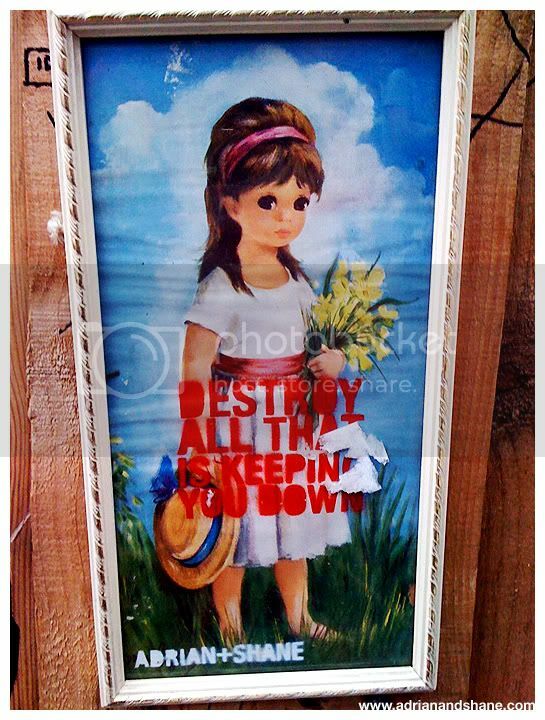 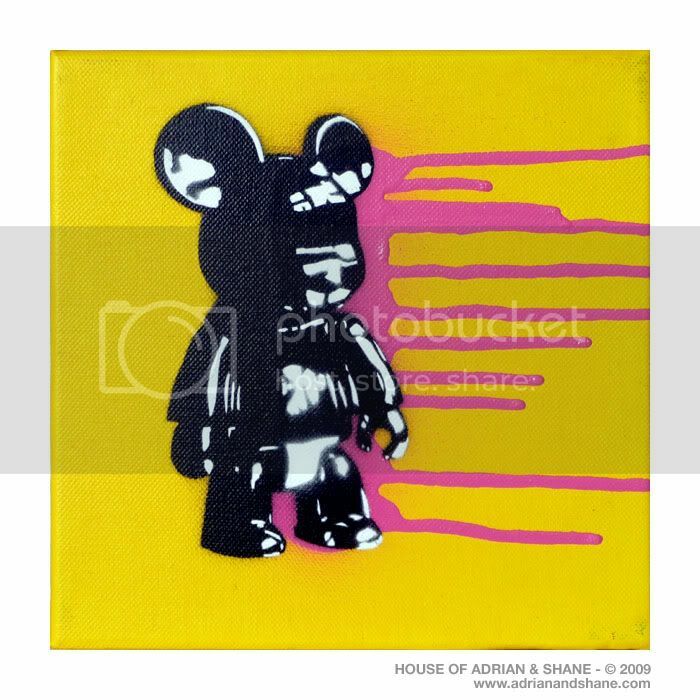 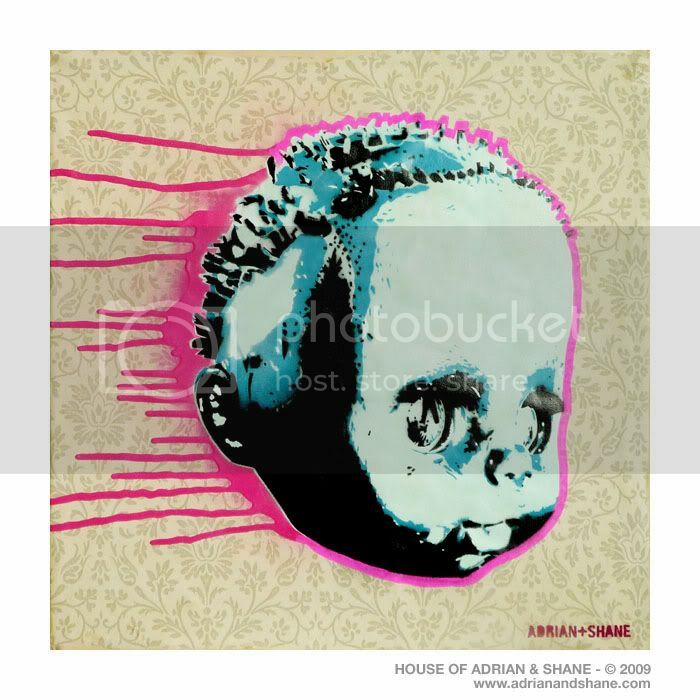 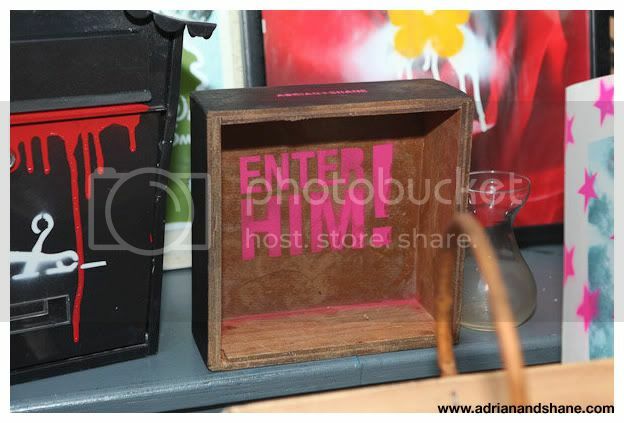 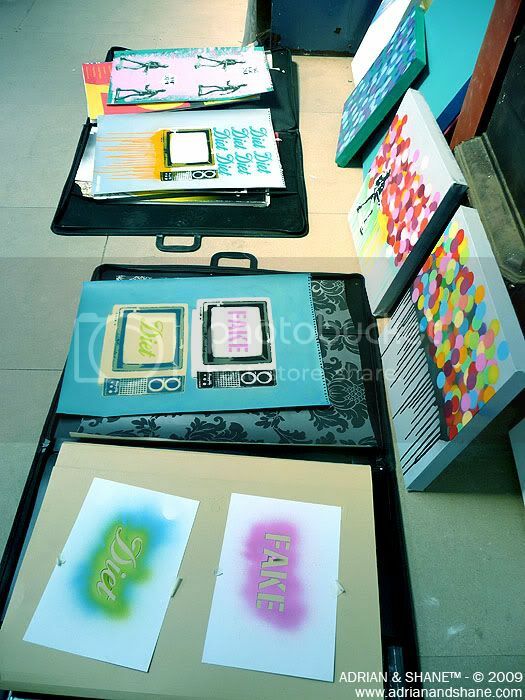 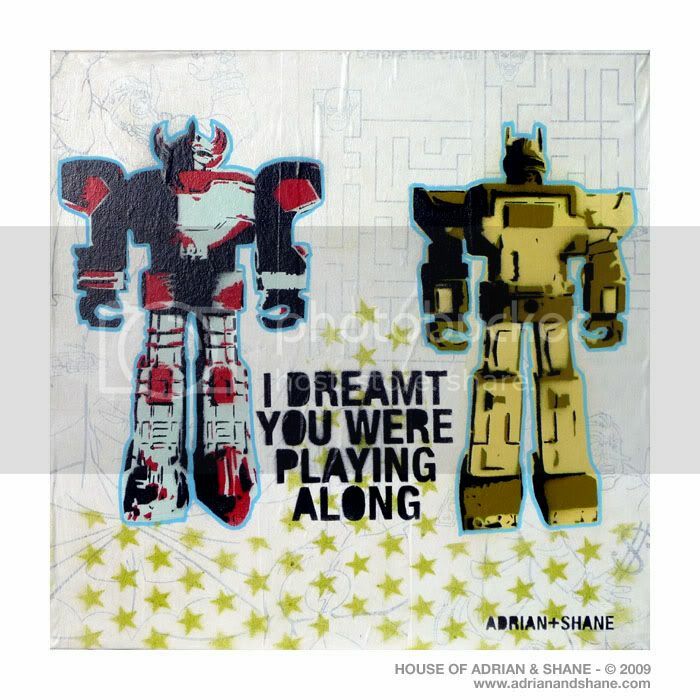 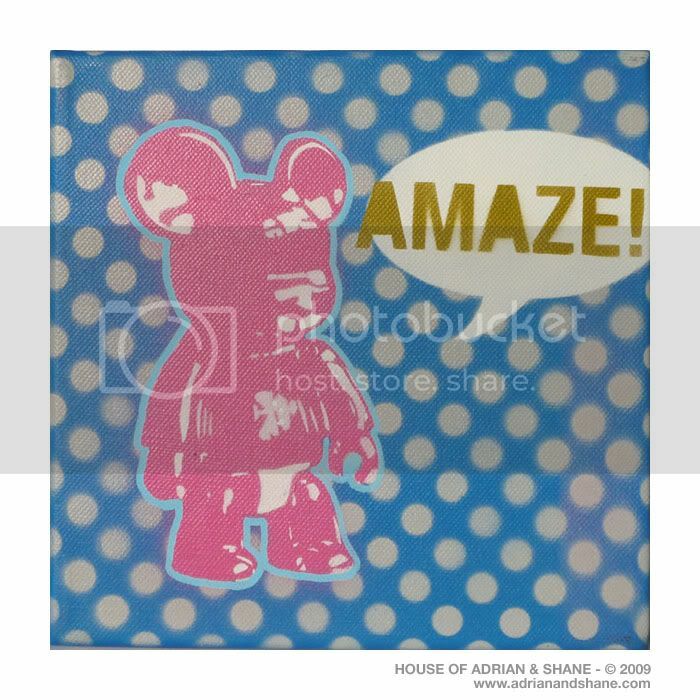 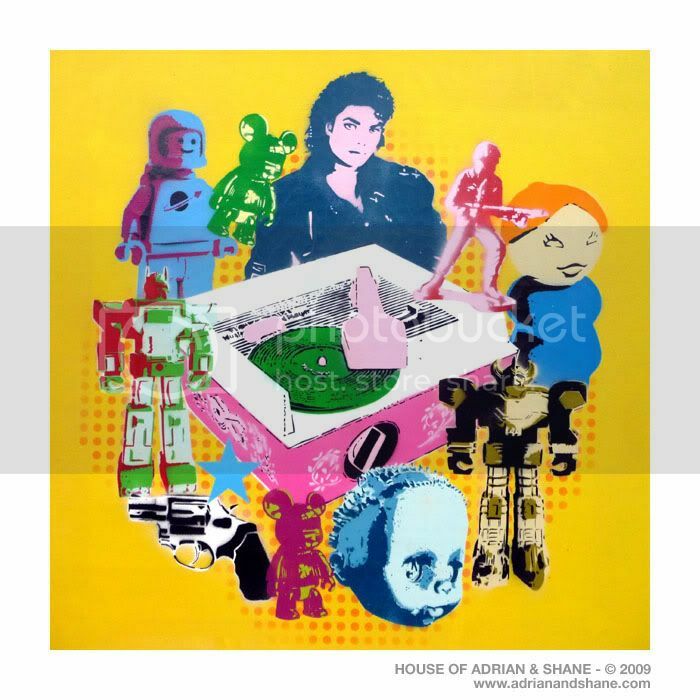 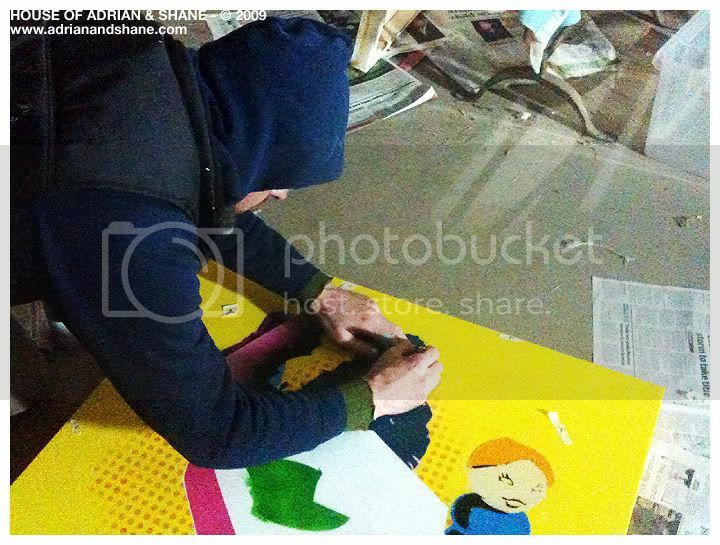 In "2010", "adrian", "art", "canvas", "madonna", "shane", "stencil"
Added on February 25, 2010 by Adrian+Shane. 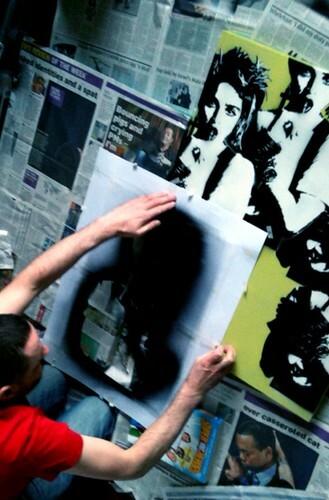 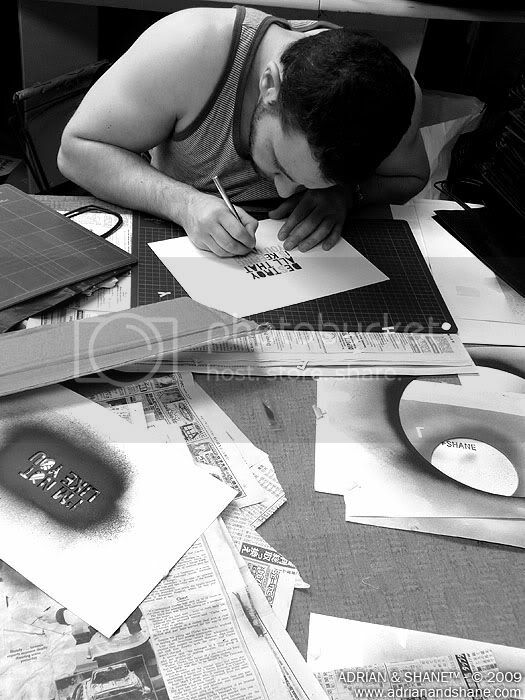 Working on a new piece for the 'Under The Influence' exhibition. 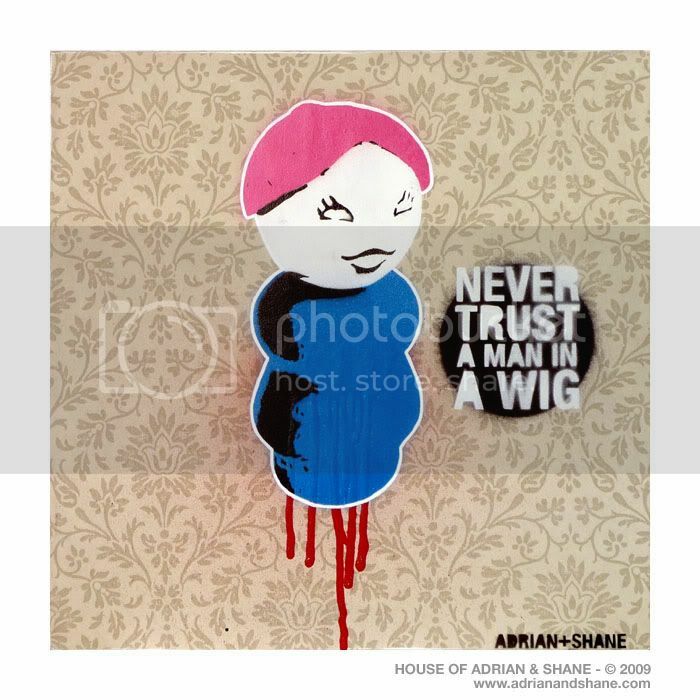 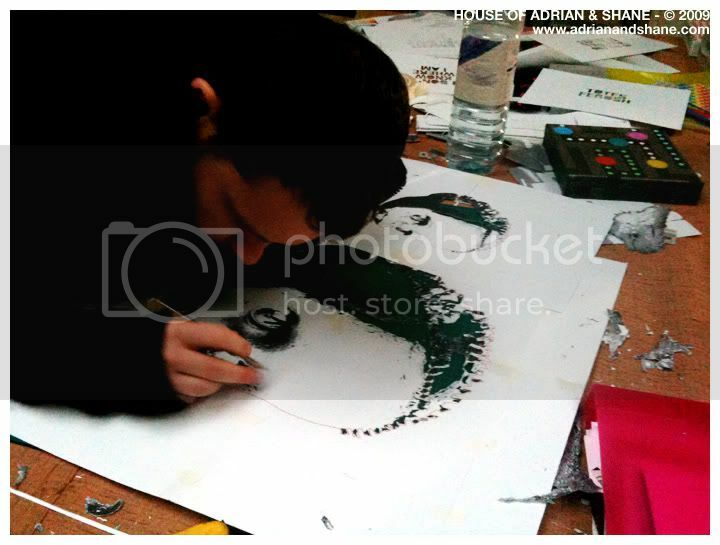 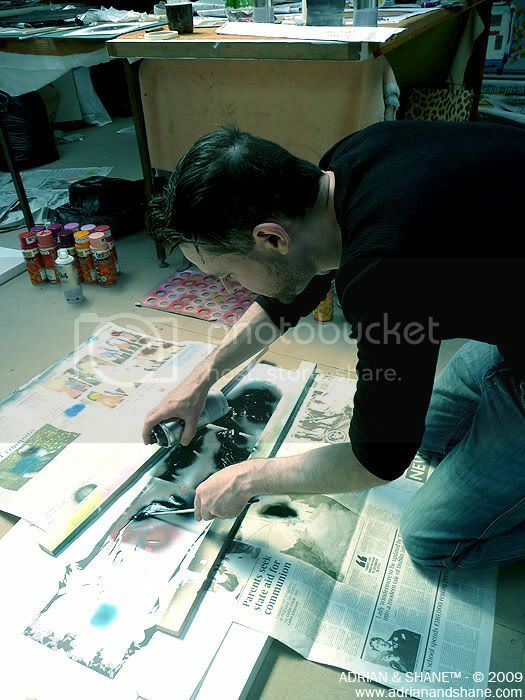 In "adrian", "art", "exhibition", "gcn", "madonna", "shane", "stencil", "studio"
Added on February 9, 2010 by Adrian+Shane. 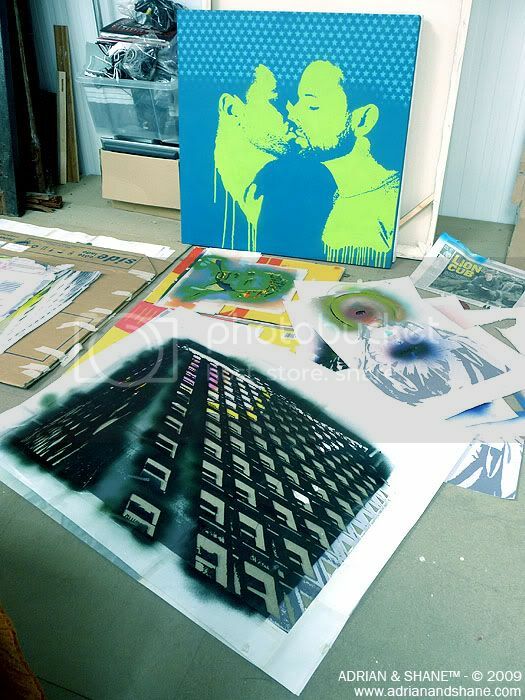 'Under The Influence' is an exciting group exhibition bringing established and emerging visual artists together to support Gay Community News. 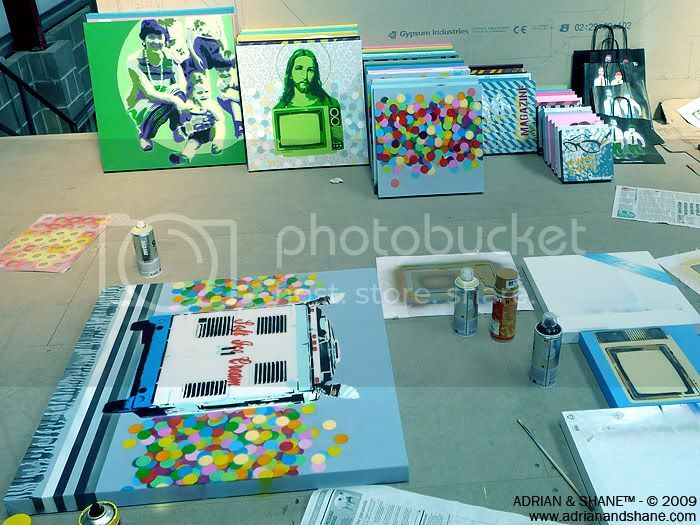 20 artists, illustrators and photographers have been selected to produce a piece of work that demonstrates their biggest influence. 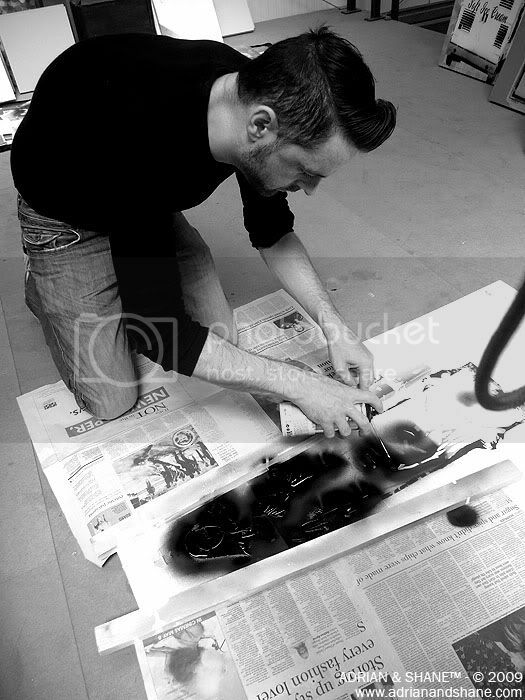 The exhibition, which opens at The Front Lounge on Friday 5th March is curatored by Will St Leger to support the GCN Forever campaign. 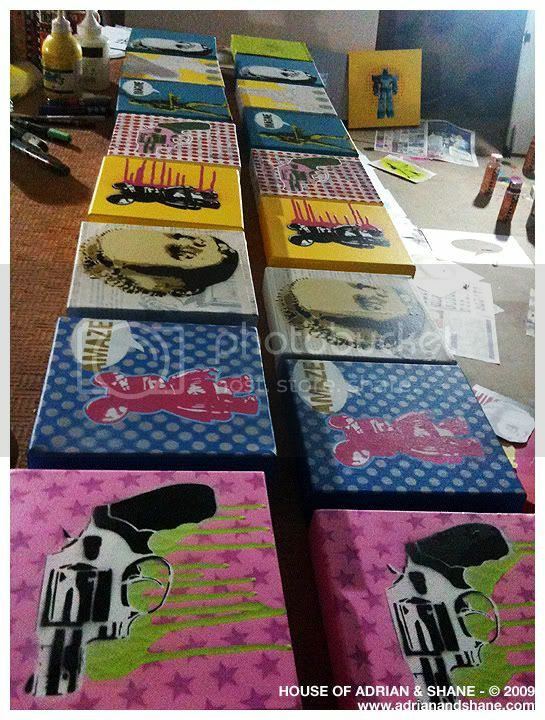 Proceeds from sale of works will be donated by the artists to support GCN. 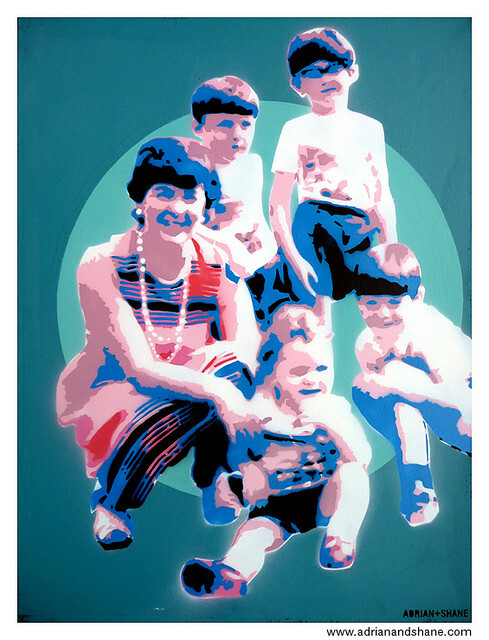 Under the Influence opens Friday 5th March in The Front Lounge at 8pm with a drinks reception, all are welcome. 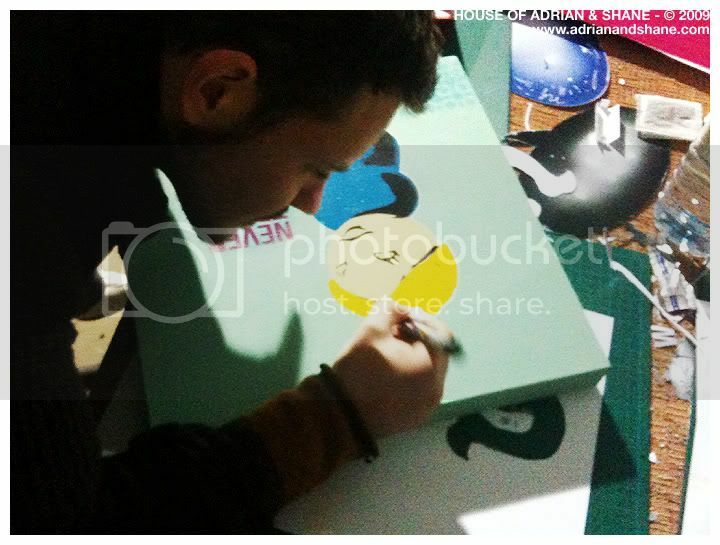 RSVP the Facebook event page here. 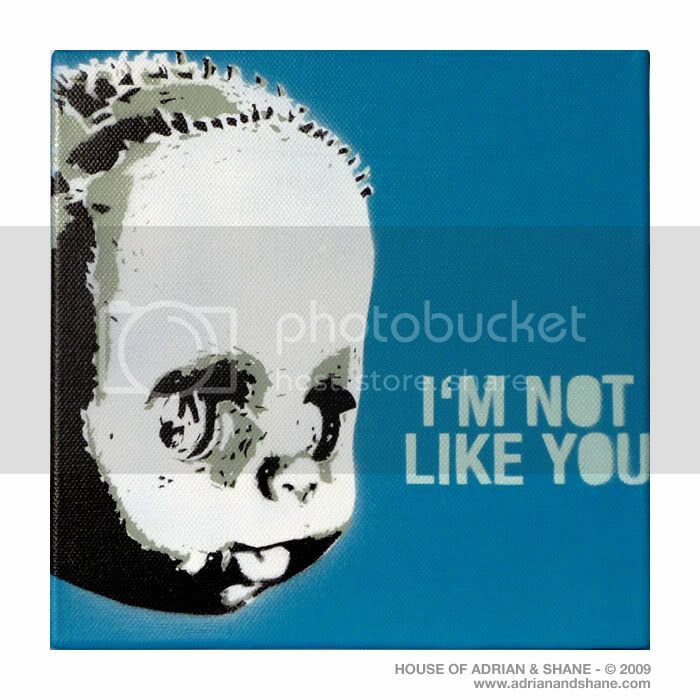 In "adrian", "art", "dublin", "exhibition", "front lounge", "gcn", "shane", "under the influence", "will st leger"
Added on December 16, 2009 by Adrian+Shane. 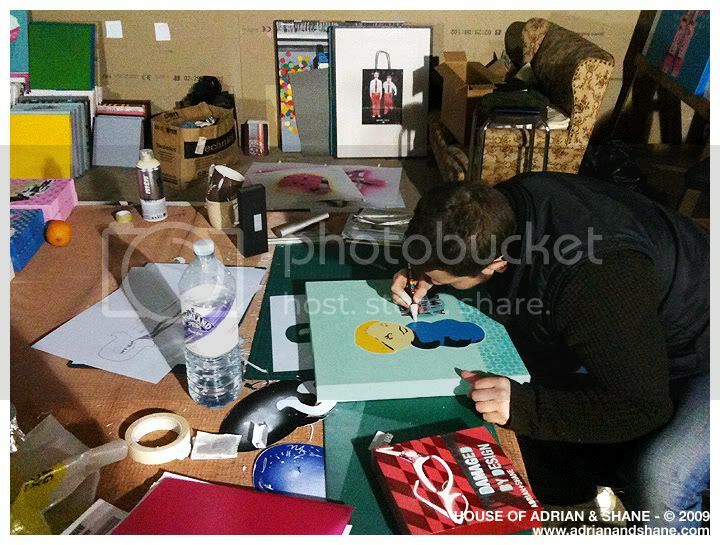 Adrian + Shane feature in the latest issue of Le Cool magazine, out today (16th December). 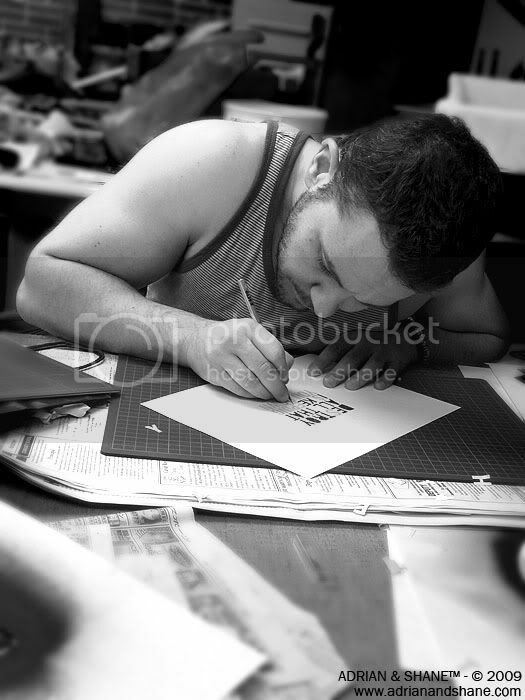 Click the image below to view larger version. 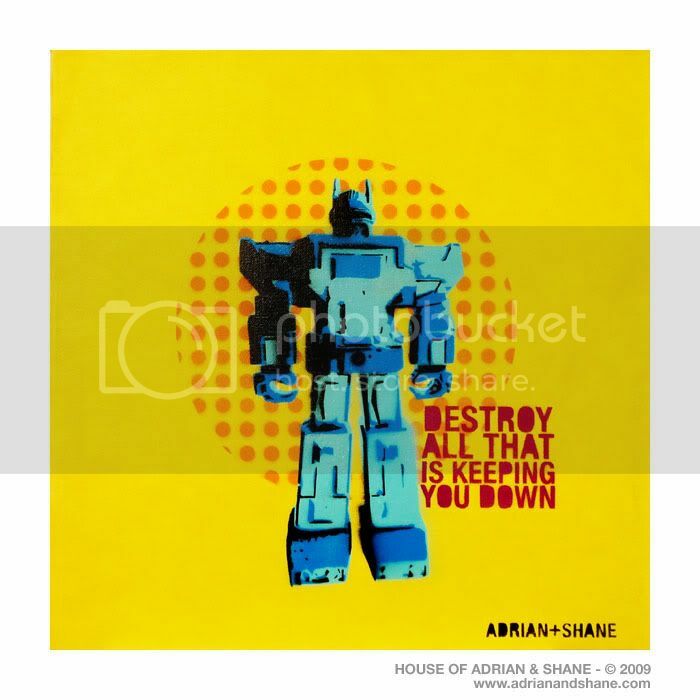 In "adrian", "art", "dublin", "exhibition", "le cool", "magazine", "shane", "show", "toy"
Added on December 10, 2009 by Adrian+Shane. 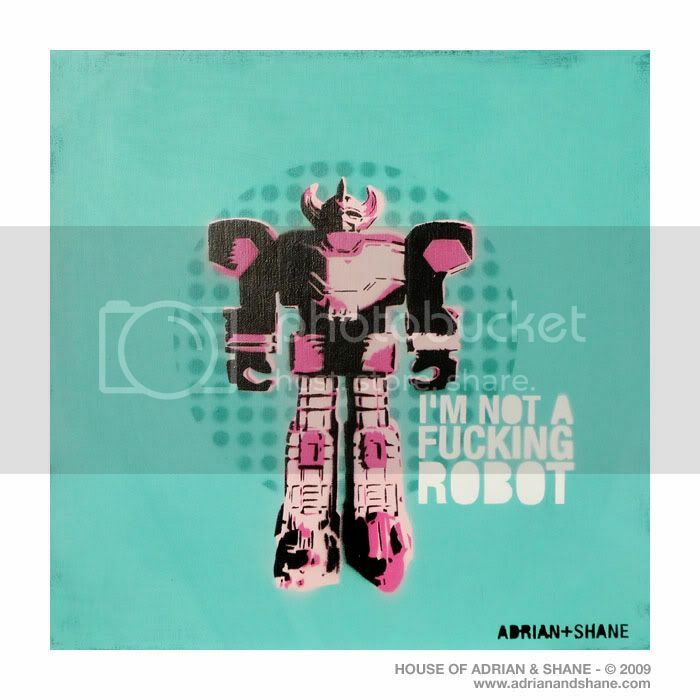 In "adrian", "art", "canvas", "doll", "dublin", "exhibtion", "front lounge", "robot", "shane", "show", "stencil", "toy"
Added on December 7, 2009 by Adrian+Shane. 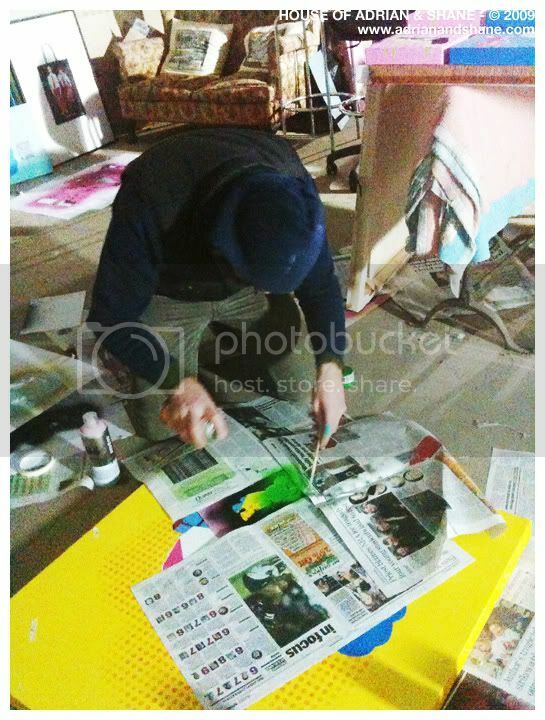 Our studio was freezing cold, so we had to wear layers and layers of clothes to try and keep warm. 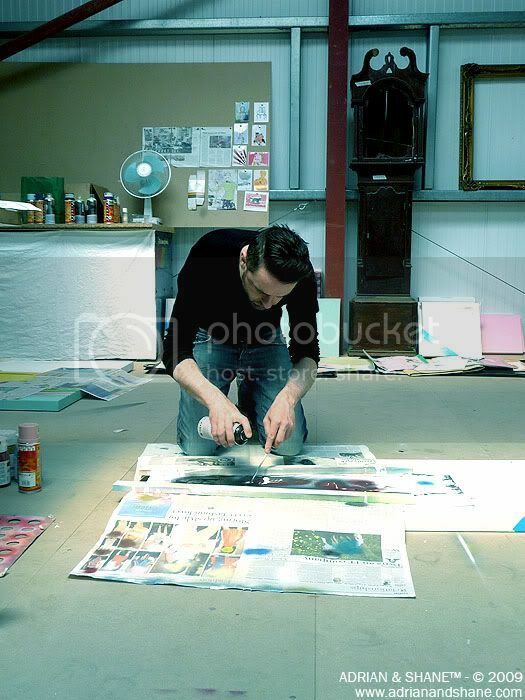 Most of the time it was dark outside so the light wasn't ideal for working in. 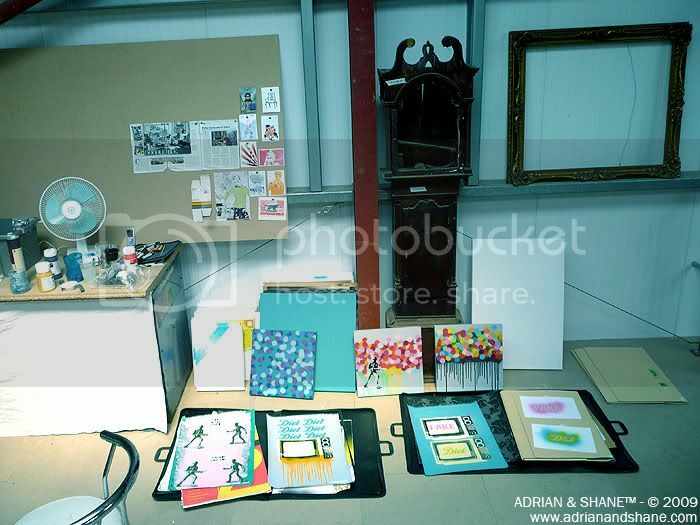 Making 'The Toy Show' wasn't easy. 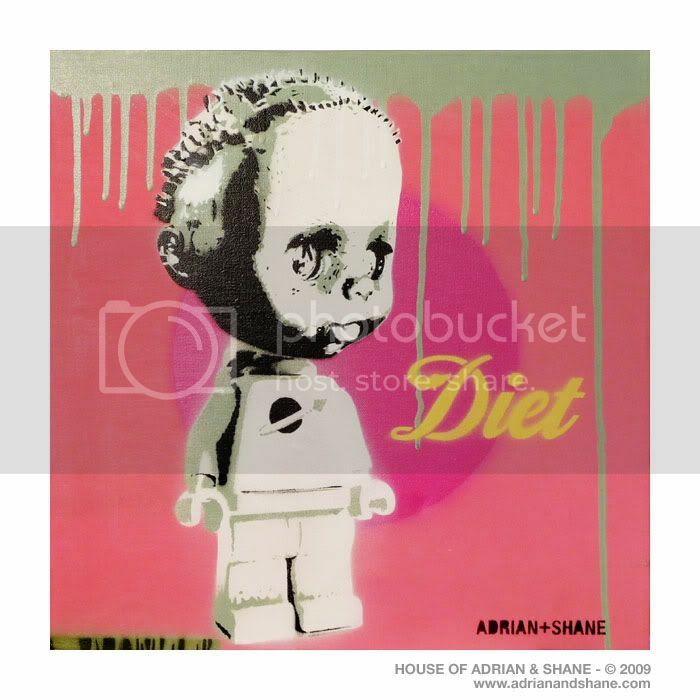 In "2009", "adrian", "art", "cold", "dark", "exhibition", "iphone", "november", "shane", "studio", "toy show"
Added on July 19, 2009 by Adrian+Shane. 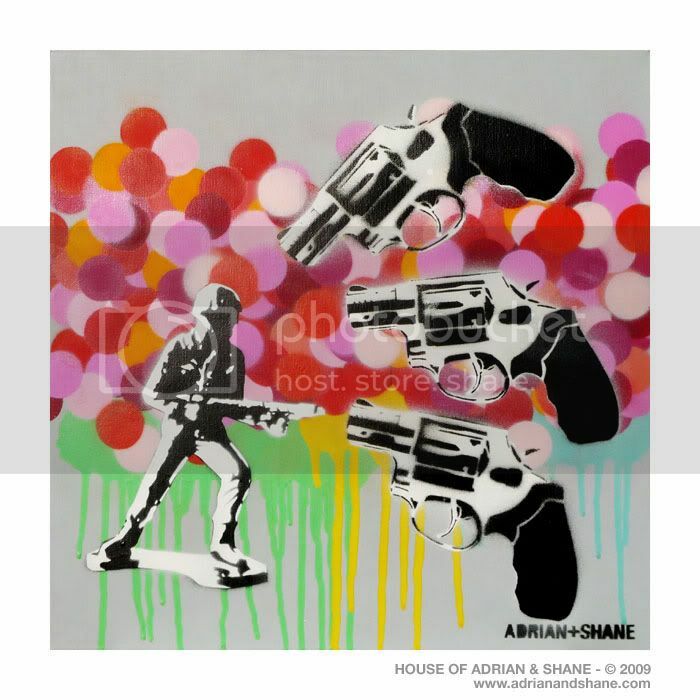 'The Antics Rogue Show' took place on 18th July 2009 at The Bernard Shaw, Dublin ... A selection of about 10 artists participated in "pimping old art" ... Its a simple idea: You turn up with your old painting/picture etc, hand it in, the artists are called in and they go to work on it live with spray, stencil, marker, blood or whatever their favourite medium is and an hour later you have a one of a kind updated piece of art. 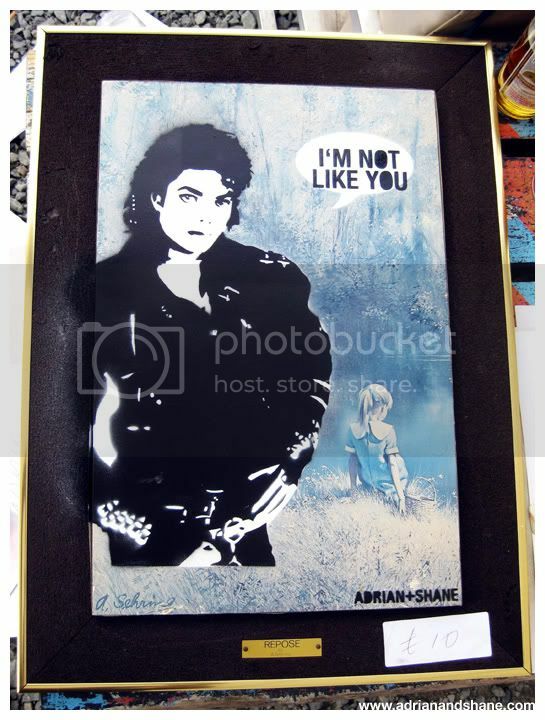 In "adrian", "antics rogue show", "art", "britney spears", "dublin", "graffiti", "michael jackson", "shane", "stencil", "susan boyle", "will st leger"
Added on June 28, 2009 by Adrian+Shane. 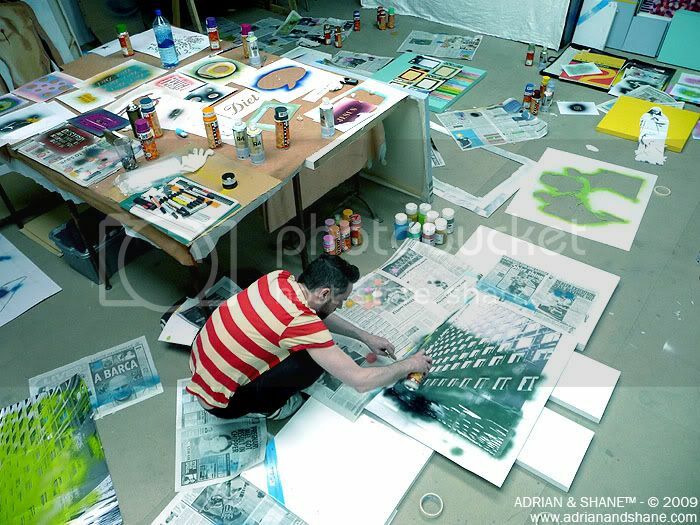 Adrian + Shane's award winning short film '42 Rotations' is now available to view online for the first time. 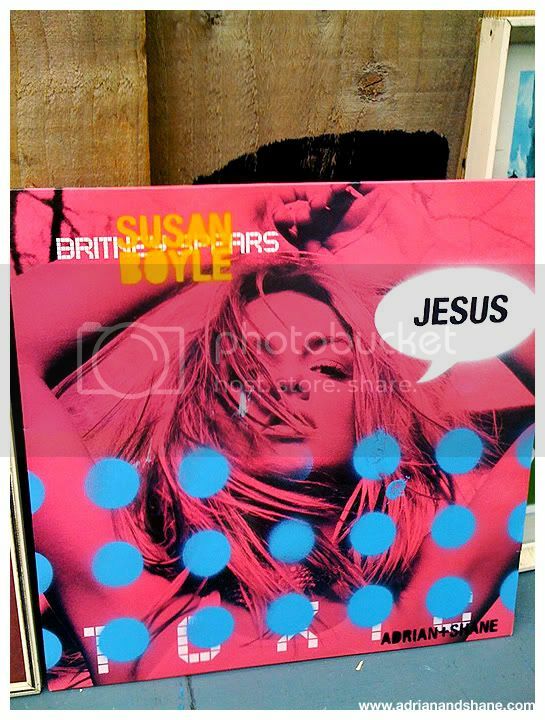 "Filmed at the Astoria (G-A-Y) in London on November 19th 2005 using a Canon IXUS 50 digital camera. 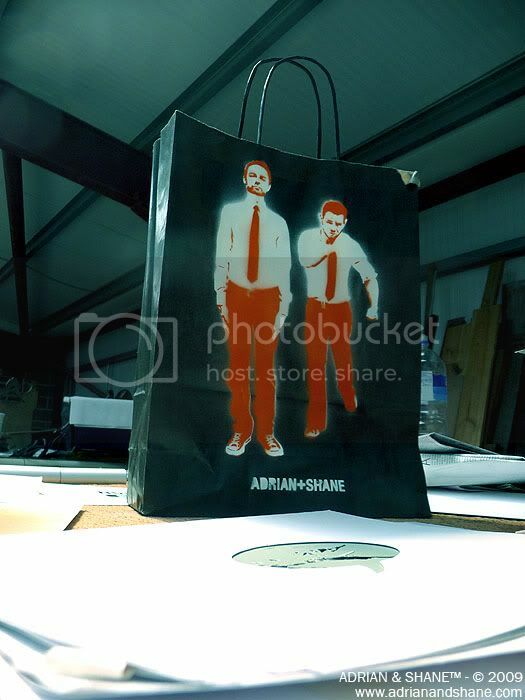 It was originally meant to take a photograph but the camera was on the wrong setting and recorded a (one second long) accidental film instead! 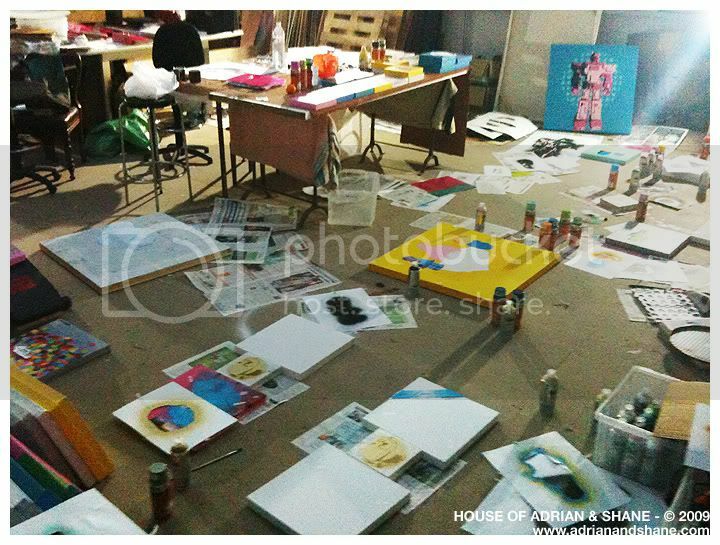 We then used that second of video footage, repeating the same clip over and over 42 times. 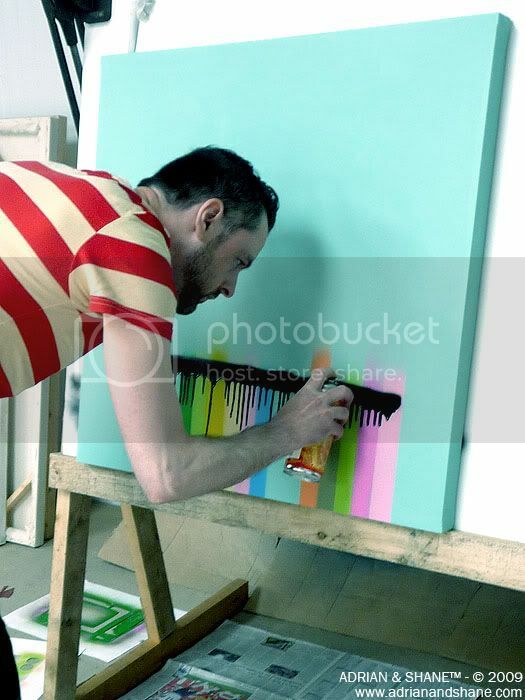 The color changes with each repetition. 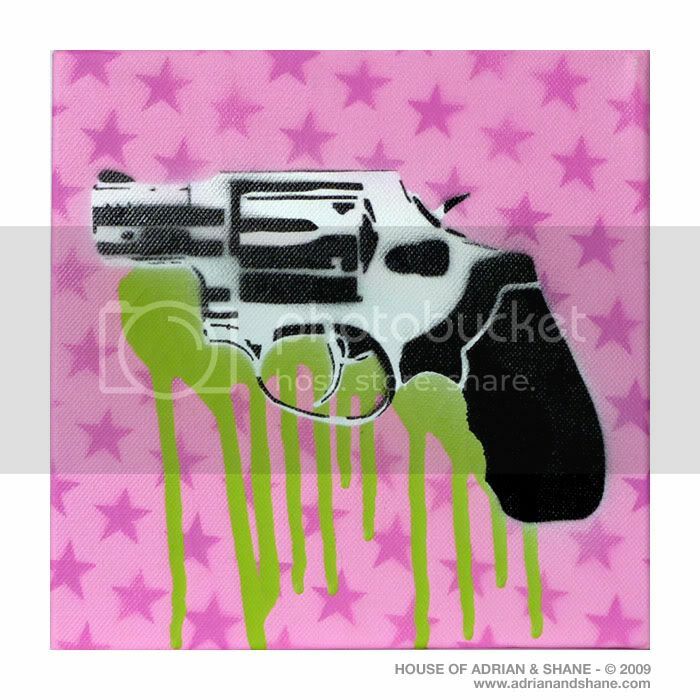 We used the original sound, you don't hear any music, just a loud violent noise." 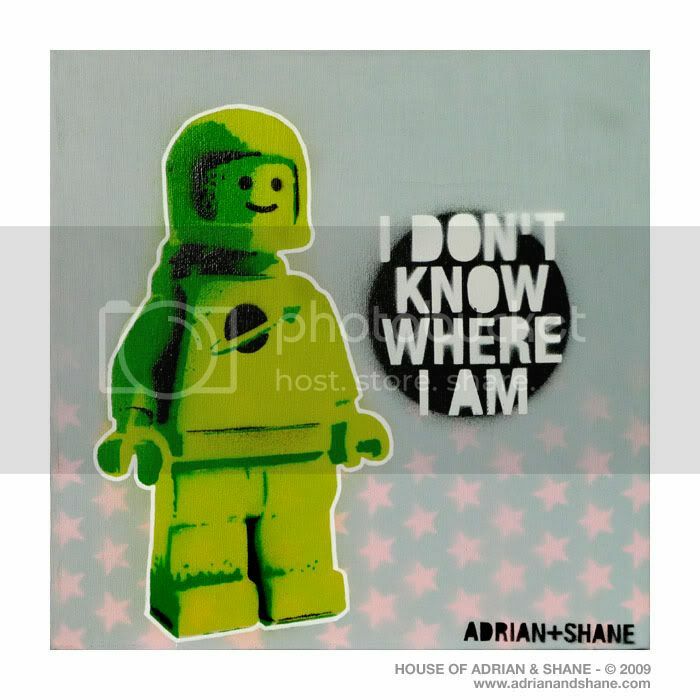 In "42 rotations", "adrian", "astoria", "confessions", "experimental", "gay", "london", "madonna", "shane", "short film"
Added on June 26, 2009 by Adrian+Shane. 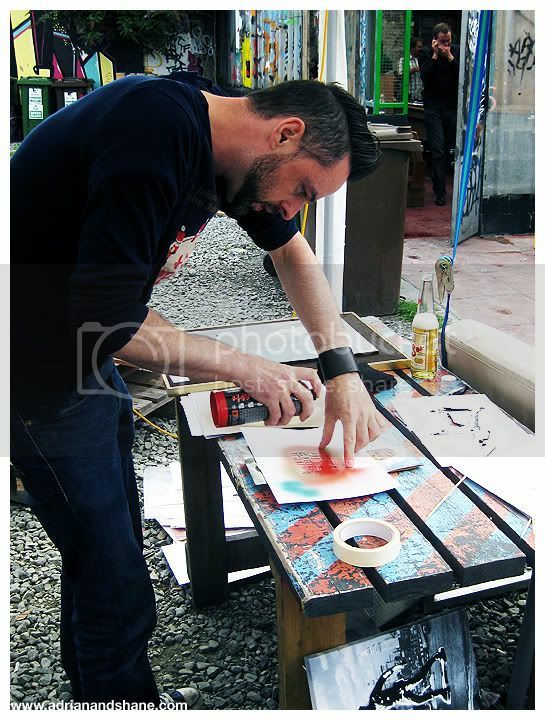 Here are some photos of us at work on our latest exhibition, currently on show at The Front Lounge, Dublin until July 1st 2009. 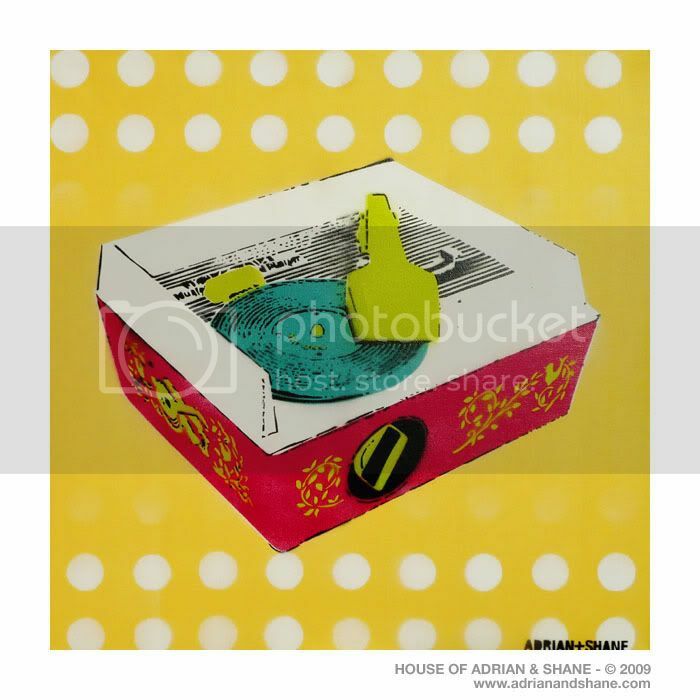 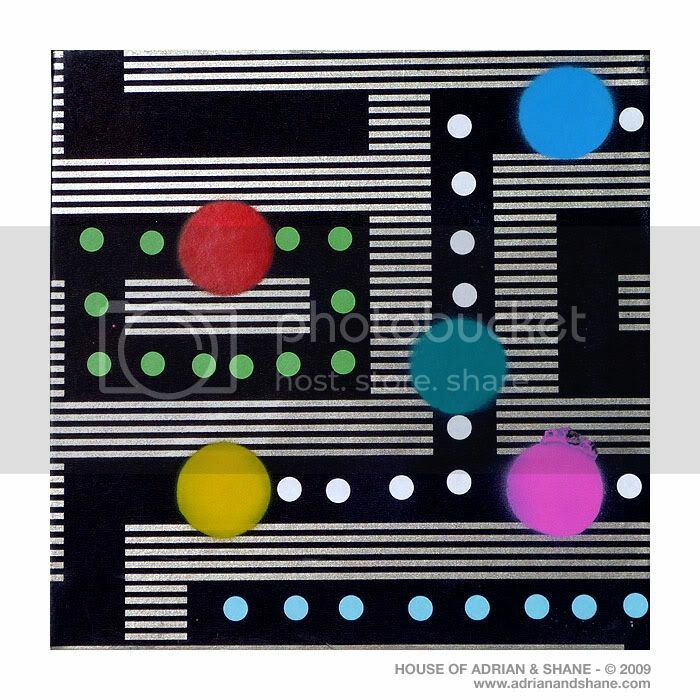 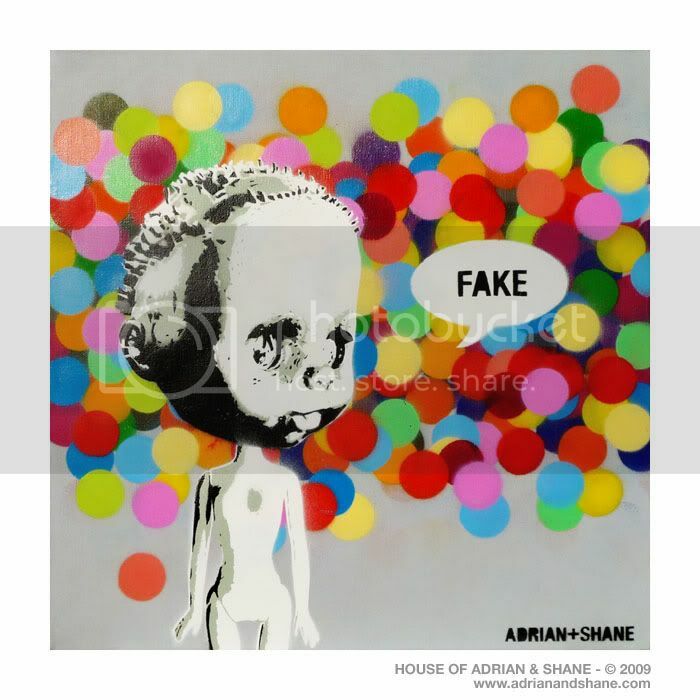 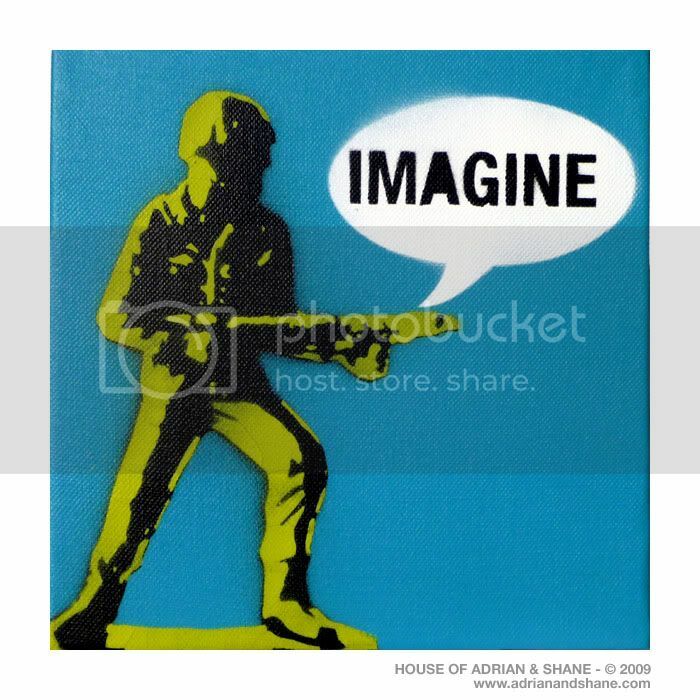 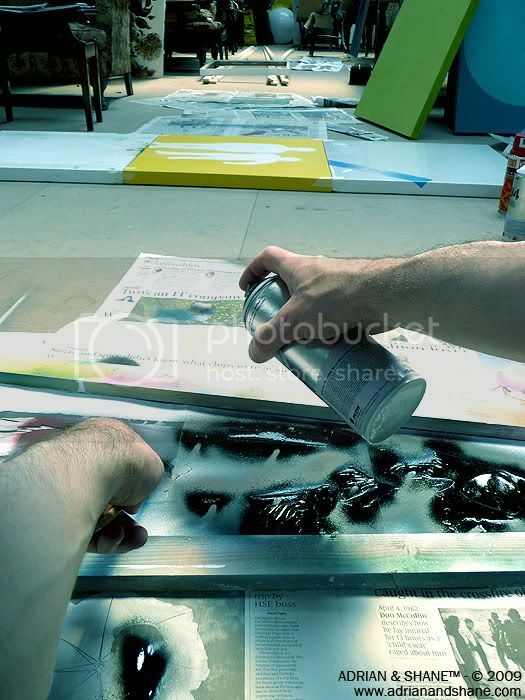 In "adrian", "art", "exhibition", "new work", "shane", "studio", "summer"
Added on January 21, 2009 by Adrian+Shane. 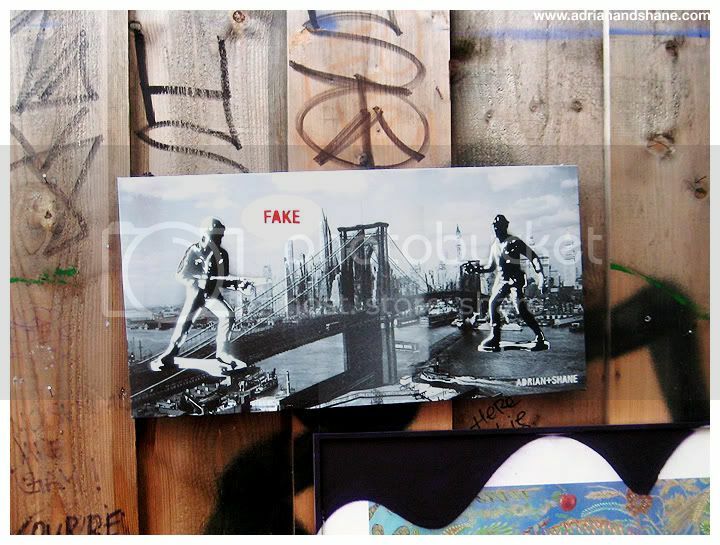 Free Art Friday is a relatively new art movement that’s rapidly gaining in popularity around the World. 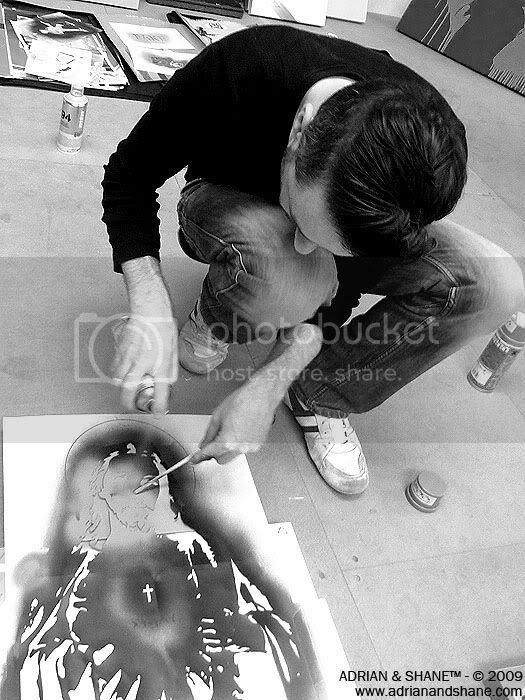 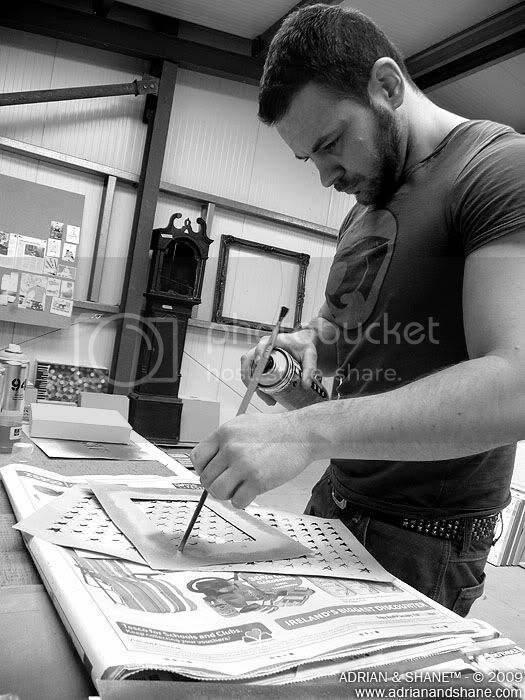 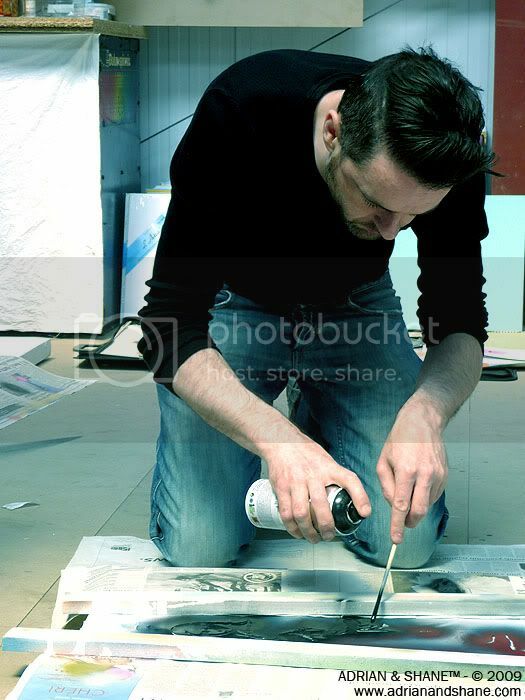 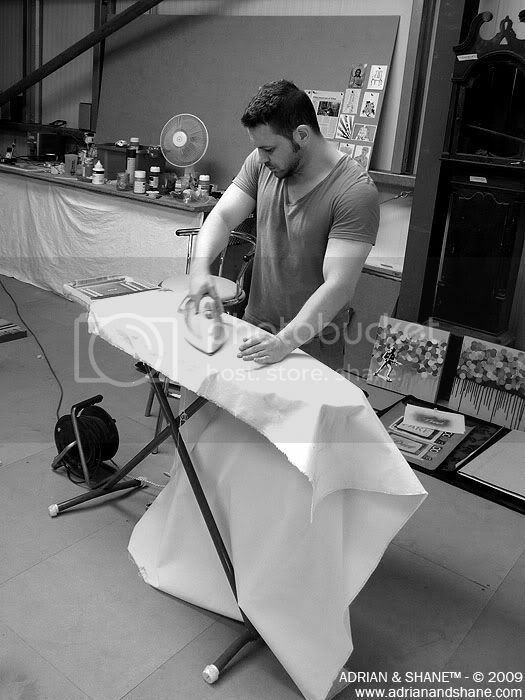 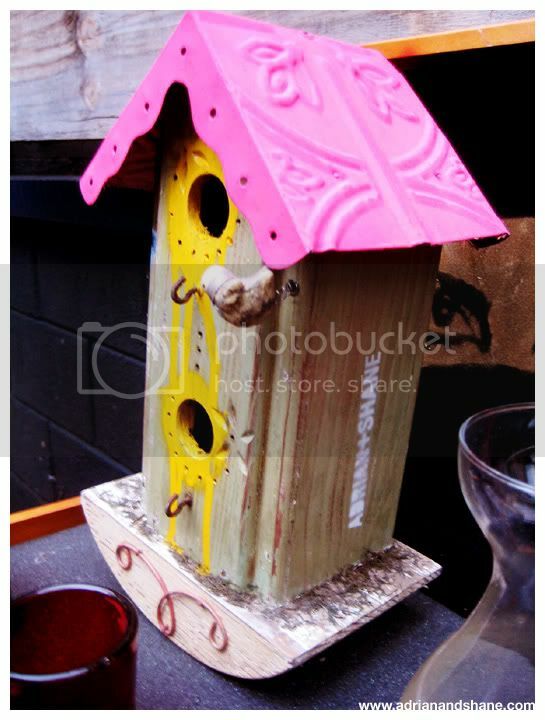 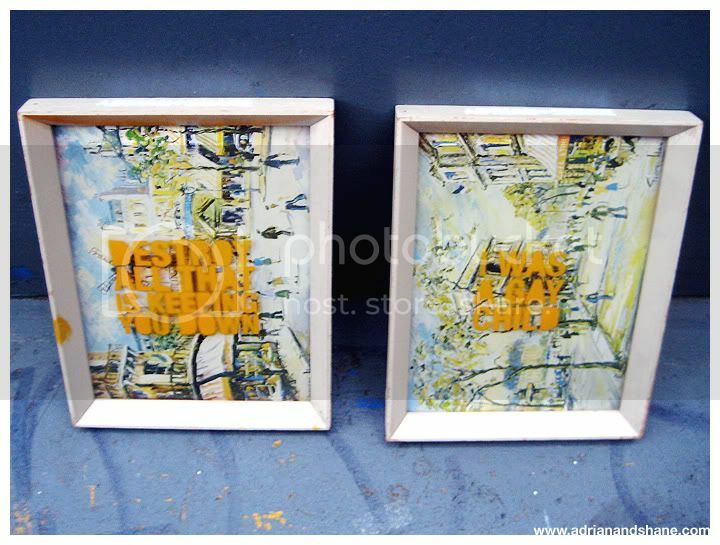 Artists create a painting, sketch, sculpture or installation and leave it on the street. 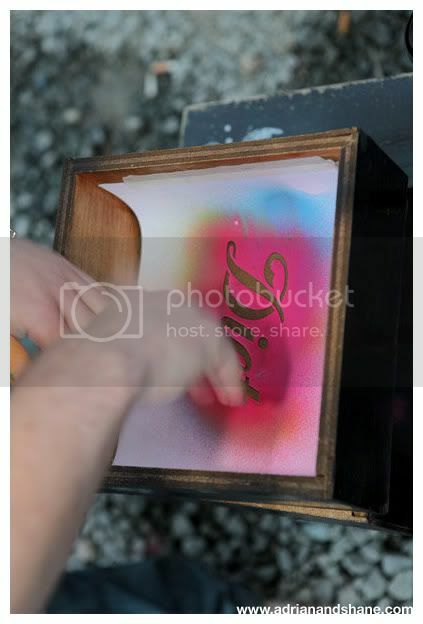 The piece can then be picked up by anyone and claim it as their own. 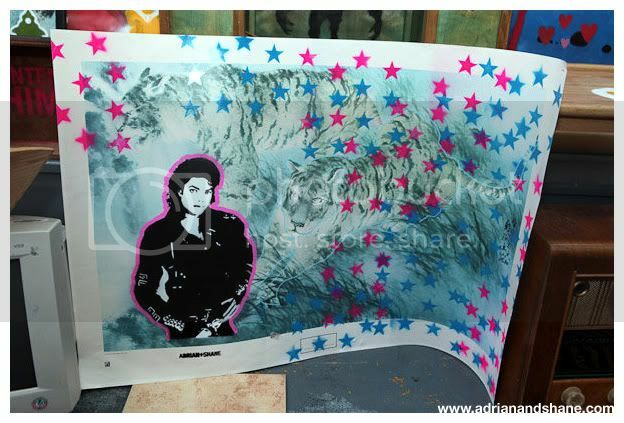 Finders are encouraged to email the artist and tell them how and where they found it. 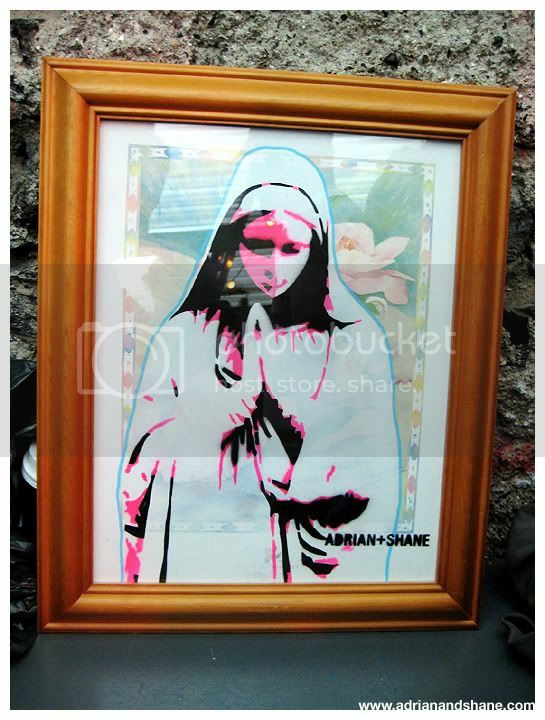 Painters, photographers, illustrators, sculptures, graffiti artists, taggers, cartoonists (or any visual artist) were invited to contribute a small piece of work that will be hung/placed/or left on the streets of Dublin on Friday 23rd January for anyone to take away. 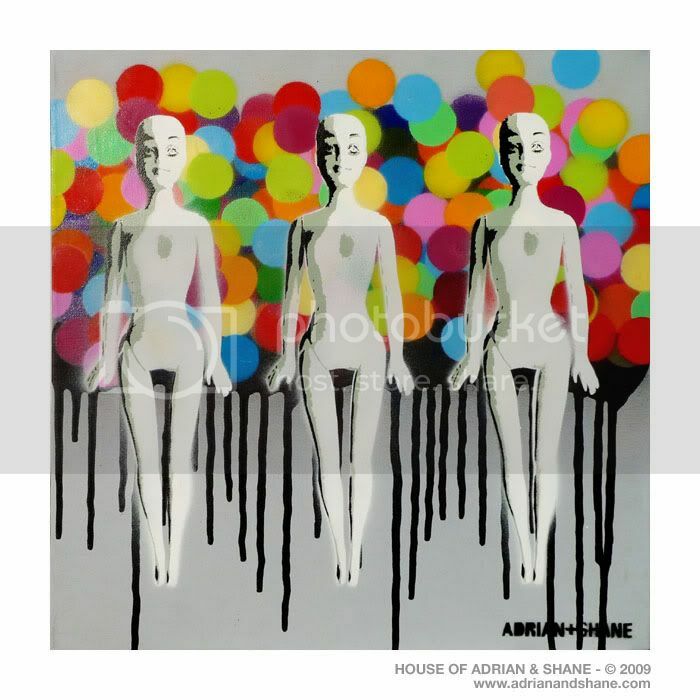 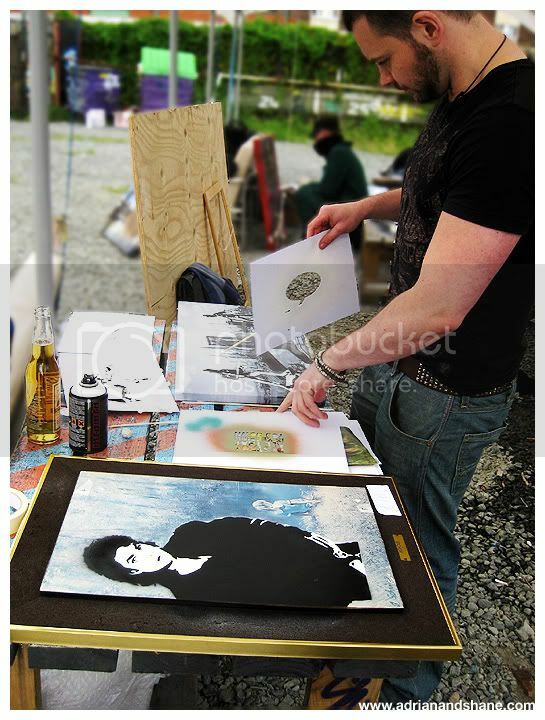 In "2009", "adrian", "dublin", "free art friday", "freeartfriday", "shane"